ABOVE: The living room, or saloon, has sofas, upholstered chairs, a bar, a gas fireplace, a library, and a collection of movies on DVD. Staircases (on left) lead down to the cabins. INSET BELOW: La Renaissance in Rogny des Sept Ecluses, the barge's outdoor table, the dining room, and the helm. La Renaissance began its life in 1960 as a French cargo barge. In 1997, the vessel was converted to a hotel barge, and it underwent another refit in 2006. After its acquisition by European Waterways in 2007, the barge was taken to a shipyard in Belgium for inspection, maintenance, and updating. The barge measures 128 feet long by 17 feet 6 inches wide, or just over 51 by 5 meters. It was built to fit the locks of the canals in central France, which are smaller than river locks but larger than the locks in the Canal du Midi. For a layman, it's impressive to watch the captain and pilot squeeze La Renaissance into a 19th Century lock that offers just inches of clearance on either side. The main or upper deck has an open bow, with a partial roof that shields the eight-person round table from sun or rain. The rest of the bow is uncovered, with a hot tub just behind the anchor winch. 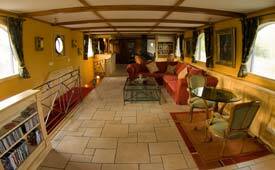 The helm, where the pilot steers the barge, is just behind the kitchen. (La Renaissance has a top speed of 10 knots, or 11.5 mph / 18.5 km/h), but most of the time it cruises at the canal speed limit of 6 km/h or 4 mph.) Crew quarters are aft and all the way forward; most of the crew live on board, although--on our cruise--the chef went home to his wife and baby most nights.